I was very eager to see how the Strava app would perform on the Apple Watch, having now used the Strava platform to record my runs for the best part of 6 months. I decided to perform 2 test runs of 3.5km, one with the Garmin fenix 3 and the other with the Strava app running on the Apple Watch, and compare these experiences. The main point to note is that the Apple Watch currently acts as an extension of the iPhone, and uses the 4G signal and GPS from the Strava app on the phone itself, and relays that information to the Apple Watch. Quite simply, the watch acts purely as a second screen when you are running. I will compare a few of the main running parameters between the fenix 3 and Apple Watch. Distance Both measured an accurate distance from where I started and stopped the run. Pace Pace with the Garmin fenix 3 was accurate, with a running time of 15min 50sec calculated an average pace of 4:31/km. Pace with the Strava app on the Apple Watch was not accurate, with a running time of 15min 43sec calculated an average pace of 4:26/km. According to my calculations, this should be an average pace of 4:29/km. Elevation Elevation variances were also noted between the two devices, with the fenix 3 showing elevation to be 24 metres and the Apple Watch to be 17 metres. It may be worth me taking the Garmin 920XT out on the same route to see which of these results may be more accurate. 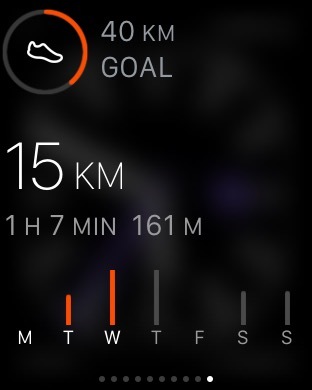 User interface Unfortunately, I am not impressed by the user interface of the Strava app on the Apple Watch. When running, the Apple Watch’s screen will go blank (to preserve battery life), and to see running stats, you must physically raise your wrist to activate the screen. This is really inconvenient. To further complicate things, after a couple of minutes, the app would close (but continue to run in the background), and raising my wrist would show the watch face. To see my current mileage/running stats, I would need to raise my wrist, click on the digital crown and select the Strava app. Not ideal. However, as with the native app, you can opt to hear audio voice-over of your mileage at periodic intervals. The only running parameters which are seen on the screen are as follows: time lapsed, distance covered and average speed. Other features The Strava app for the Apple Watch also promises to be a valuable multi-sport companion, with the option to toggle between running and cycling. Other features include segment alerts (for premium members). For those who are not aware, segments in Strava are short distances which tally-up the running times from all runners who run through them, and form leaderboards, accordingly. This allows you to keep sharp, and is a good motivator for the competitive runner within us all! 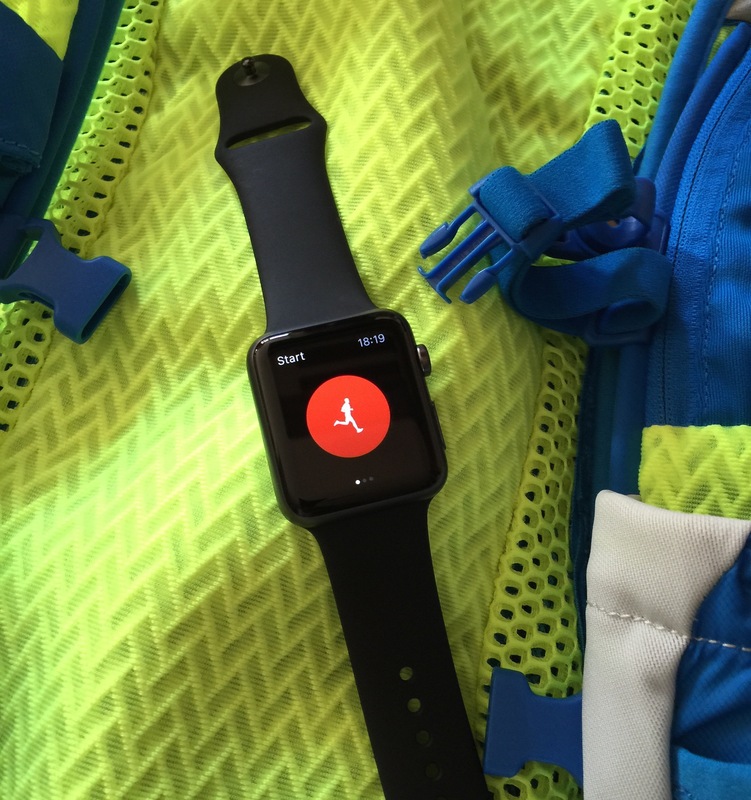 With the Apple Watch, just before you approach a segment, you will be alerted and can decide to increase your pace. I can only hope that this feature will some day be incorporated into Garmin watches, too. One of the functions I really appreciate in the new app is the ability to see my weekly run data in Apple Watch glances. Swiping up from my watch face will allow me to see my weekly mileage and goal, also including running time and elevation. This is not a game changing feature, but a nice addition which will keep me up-to-date with my goals, without having to take my phone out of my pocket and open the native Strava app. Final thoughts Conclusively, I didn’t buy the Apple Watch for running, so I am not overly concerned with this missed opportunity. There are quite a few issues that need to be addressed before the Apple Watch and Strava app can be taken seriously as a running tool. I can see it having a definite target audience, but it is just not suitable for my needs. I will be running with my Garmin fenix 3/920XT watches for the foreseeable future. I did have fun testing out the novelty of running with the Apple Watch, and at this stage, that is all it is. Good review as always Andy. Looks like Apple is not quite there in terms sports watches. Cheers, dude! It really is designed for casual gym goers. No doubt the fitness features will improve, but at this stage, it is no way near the bigger players like Garmin.